In order to give an opportunity to choose the right jobs for candidates, trained in technical education and the passed-out students, who are searching for jobs, the GIMT Guwahati is getting ready to host a mega job fair in its campus at Azara. The job fair will be held at the campus of Girijananda Chowdhury Institute of Management and Technology (GIMT) Guwahati on February 8, 2019. The fair is exclusive for students trained through Employability Enhancement Training Program and 2019 passed out. 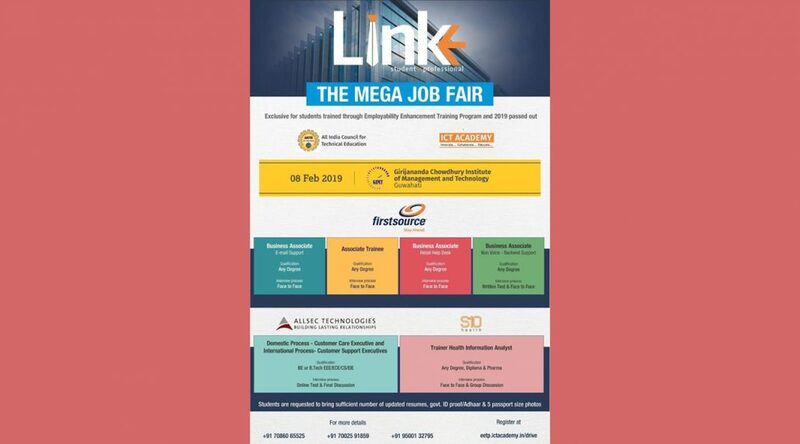 The job aspirants, who want to be a business associate (e-mail support/retail help desk/non-voice – backend support); associate trainee; customer care executive (domestic process), customer support executives (international process); trainer health information analyst, may visit the job fair to test his or her luck for a job. According to the promo of the event, for the post of business associate (e-mail support), the qualification is any graduate and the interview will be face to face. For the post of associate trainee, any degree holder can come. For this job, the interview process is face to face. The job seekers, who want to be business associate in retail help desk, need to be any graduate and for this, the interview process is face to face. Meanwhile, for the post of business associate (non-voice – backened support) the candidate can be any graduate but he or she will have to appear in both written test and face to face interview. For the job of customer care executive (domestic process), the candidate should be a BE or B.Tech EEE/ECE/CS/EIE and for this job, the candidate will have to face an online test and a final discussion. The candidate, who wants to become a trainer health information analyst, can come if he or she has any diploma in healthcare or pharmaceutical course. The interview process will be – face to face and group discussion. The organisers have informed that the students/candidates will have to bring sufficient number of updated resumes, government ID proof/Adhaar card and 5 recent passport size photographs. They can register at eetp.ictacademy.in/drive and for more details can contact at +91 70860 65525 / +91 70025 91859 / +91 95001 32795.